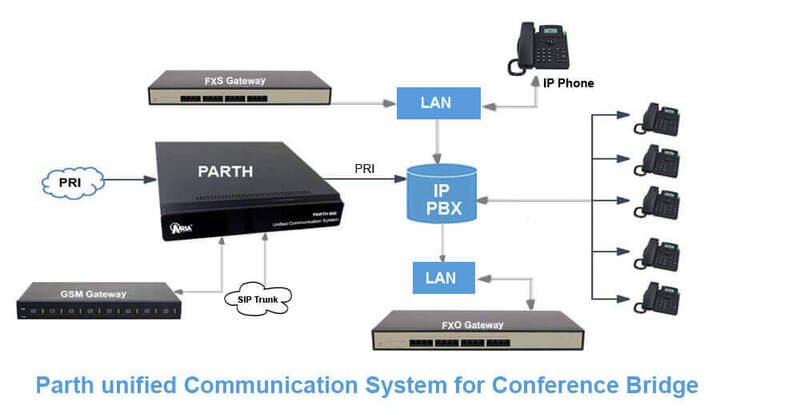 Conference Bridge is an application to to generate multiparty telephone conference system with authentication. It can be on inbound or outbound calls. In simple conference, somebody has to dial multiple numbers & then all of them join the conference. It takes lot of time if numbers of participants are higher. And person who has connected initially has to wait a lot. sometimes there might be a disturbance at one end & it can disturb the complete conference. 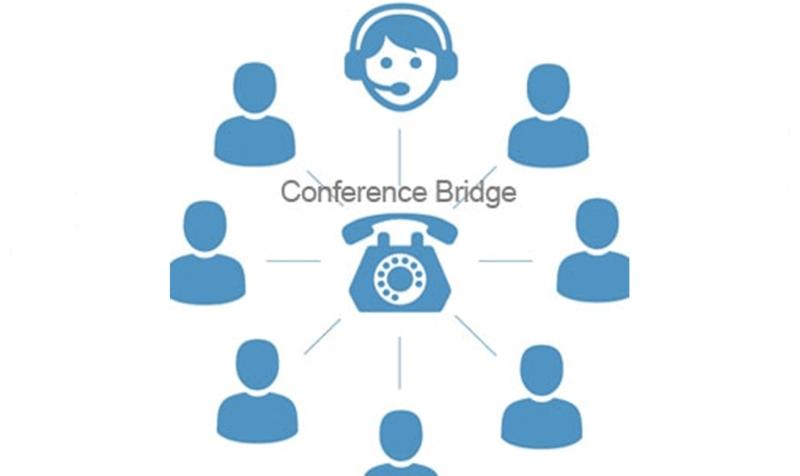 Nowadays conference bridge holds good for major discussions or decisions with the delegates of an organization from any region to get connected on a con call. 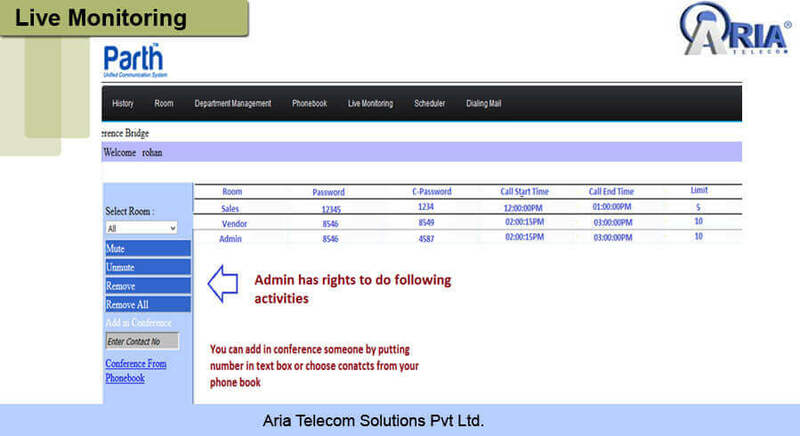 This application has all the features that are required on a con call. A typical conference bridge handles multiple traffic streams from each party on the call. This traffic of the calls can be bi-directional and It is this application which bridges the call into one seamless conference. 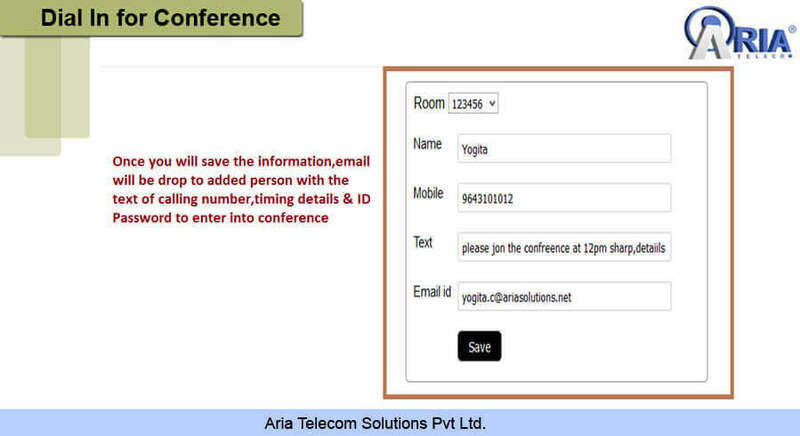 In Conference Bridge, you can allot one dedicated number for conference. System will automatically answer all calls & ask the caller to press his pin & to record his/her name. Conference timing can be sent to all participants by email or SMS. Another way is, system can call all the participants at scheduled time & take them into the conference room without wasting any time. 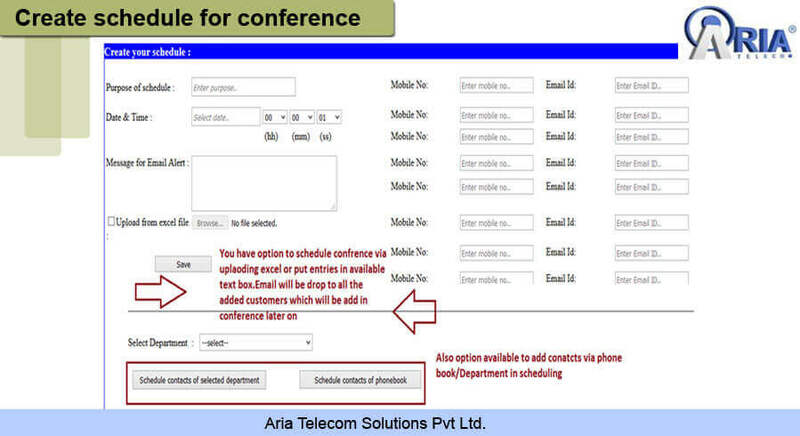 System can automatically call all participants at pre-schedule time & add them in conference. Government department head or leader can interact with their multiple subordinates any time without traveling long distance. It is also useful for government to communicate their achievements & work with states, district & gram panchayat level & direct public. A person working at lower post like gram panchayat can directly interact with Prime minister easily & can report his grievance & suggestion. This can remove the distance between lower representative & top leadership & can help in curbing the corruption gap. Security-by using credentials can join conference. This product will help you for the conference call with the delegates of any organization. In this you will have 30 seated license for the agents and each could have their own conference calls scheduled. The system could be connected via PRI/SIP/Analog lines. It has the UI for monitoring the connected agents and has complete reporting feature. This product will help you for the conference call with the delegates of any organization. In this you will have 60 seated license for the agents and each could have their own conference calls scheduled. The system could be connected via PRI/SIP/Analog lines. It has the UI for monitoring the connected agents and has complete reporting feature. This product will help you for the conference call with the delegates of any organization. In this you will have 90 seated license for the agents and each could have their own conference calls scheduled. The system could be connected via PRI/SIP/Analog lines. It has the UI for monitoring the connected agents and has complete reporting feature. This product will help you for the conference call with the delegates of any organization. In this you will have 120 seated license for the agents and each could have their own conference calls scheduled. The system could be connected via PRI/SIP/Analog lines. It has the UI for monitoring the connected agents and has complete reporting feature. Q1) What is Audio Conference Bridge? It is a telephony system which is designed specifically to allow multiple peoples in one call. Controller who initiates the conference & having a rights to control the whole conference by using privileges like to mute all the participants, dial out a participant, listen the recordings & Create/Edit another conference room etc. A participant could be anyone invited by the controller to add in conference. Participant will have an invitation with the details of dial in number & PIN which was shared by the controller. Q4) Is there separate PIN for Controller & participants? Yes PIN’s are separate for both them.Partcipants can add in conference by entering their pin & announcing their name. They will be connecting with line & music will be play till then controller is not added. Q5) How PIN can be Generate for controller & Participants? Web interface is available where you can generate the PIN’s for both of them. Q6) How Many people can add in conference at a time? Multiple people can add in conference. Its depends on your calling medium or available channels like if you are using dedicated one PRI line for system, it consist 30 channels and at a same time 30 People can occupy their seats for conference. Q7)	What is Dial out & Dial In? Q8) What equipments are requiring to setup? Server with installed application & software’s for the conference, it will be the asterisk based solution & Operating System will be centos 6.8. Q9)	If a person is disconnected during the conference, how he/she can get back to the conference? He/She will redial the number and rejoin the conference or controller can dial out their number to add in. Q10) Can we set any welcome tone while entering in conference? Yes, when you will enter the PIN to add in conference a welcome note will be announce. Q11) How can we get the conference recordings if would like to share with anyone? 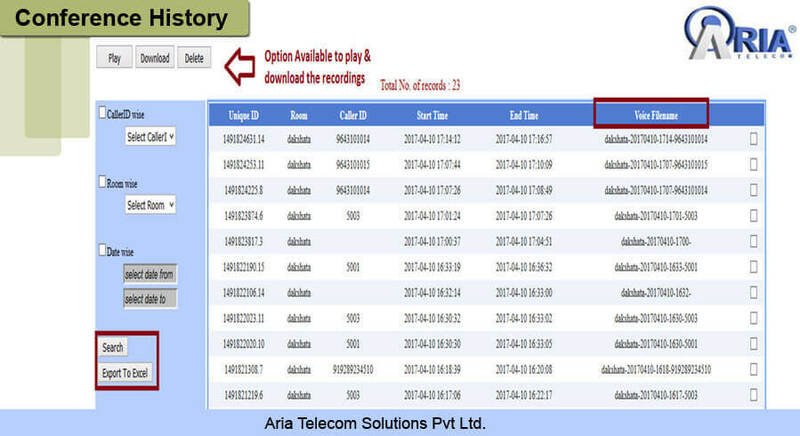 We provide a web interface which includes the facility of listen/play/download the recordings with other features like MIS Reports, Create/Edit/Delete Room etc.